Pushing the Bishir/Bisher lines back to the original emmigrants has been a big challenge for all of us. The branch that settled in Highland County, Ohio in the 1830s has not been documented prior to Christopher Bishir Sr.'s birth date in Pennsylvania or Alsace in 1759. In fact, we had never been able to absolutely prove that Christopher Bishir's sons (so we suppose), Jeremiah and John Bishir, were brothers of Jacob, Christopher Jr. and Jonathan. And what about the Bishers of northern Ohio, George and his son, Aaron Bisher? And the Bishers of Pennsylvania that descend from Samuel and Elizabeth Bisher? Are we all related? Where is the common ancestor, if any? It may be that the only way to push us "over the hump" is to get some DNA tests done. DNA testing is a relatively new part of genealogical research. While it cannot tell you exactly who your ancestors were, it can be useful in narrowing down the search for them and in proving that two seemingly independent branches of the family are, in fact, closely related. Y-DNA tests are of living males who bear the surname of interest. For the tests to be useful, the male that is tested must have an unbroken male descendency from a common ancestor. For us, this means we need to find some living males who have the Bishir/Bisher last name. As rare as the Bisher/Bishir surname is these days, that makes this quite a challenge. But if we can convince those we can find to be tested, the results should prove very interesting and helpful to us in our ongoing research of the family. It would seem that the George Bisher line of Hancock Co., Ohio is directly related to the Samuel Bisher line of Luzerne Co., Pennsylvania. In fact, these two men were probably brothers. It also appears that the Christopher Bishir line of southern Ohio and Indiana are not related to George or Samuel. The slight differences between the descendents of Jonathan Bishir and Jeremiah Bishir are not particularly significant. Two markers not matching (out of 43) would indicate a common ancestor within 10 generations. Jonathan and Jeremiah could be brothers - or cousins. DNA can't tell us precisely. However, it seems likely from other evidence that they were brothers. Kits 450347 and 464489 are descendants of Simeon Jacob Beisheir of St. Louis, Missouri. Kit 201076 is the descendant of Jonathan Bishir mentioned above. Kit 450583 descends from Conrad Bescherer (1784-1846) of North Carolina (who does not match any of the southern Ohio Bishirs), and kit 127354 descends from Samuel Bisher (1791-1877) of the Luzerne Co., PA and northern Ohio Bishers (who does not match any of the above families). So there are three different, unrelated families in America that we have so far identified using DNA tests. Y-DNA tests can only be purchased from Family Tree DNA now. A test costs about $150 (if done through our DNA project above). If the test results are then entered into various databases on the Internet, it is possible to find others with identical or near-identical markers who are also researching their family and make useful connections. Usually the test involves swabbing the inside of the mouth and sending the sample to the lab. 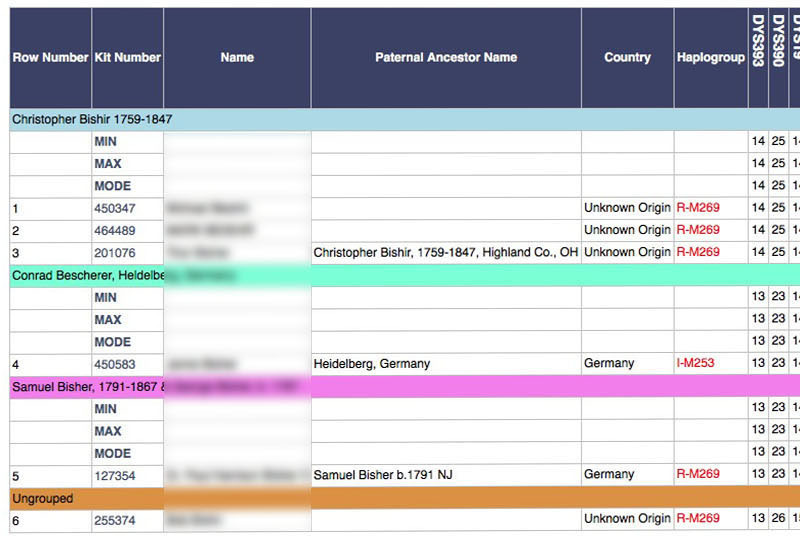 A report is returned with the marker values and information about the major groups the individual can claim as ancestors. Privacy is generally not an issue since the markers tested are not unique to one person but rather are shared with numerous other individuals throughout the world, and these labs are very careful to protect personal information. I encourage Bishir men from other lines to pursue this testing, if financially possible. Bishir ladys, encourage your brothers or fathers. I'm looking forward to everyone's results! We have also been using autosomal DNA tests to good advantage in our search for descendants and relatives of Christopher Bishir (1759-1847). To date we have confirmed over 20 living descendants of Christopher Bishir using autosomal DNA. Autosomal testsing is not as precise as Y-DNA, so not everyone matches everyone else. Consequently, tested descendants form a "Bishir web" of relationships. 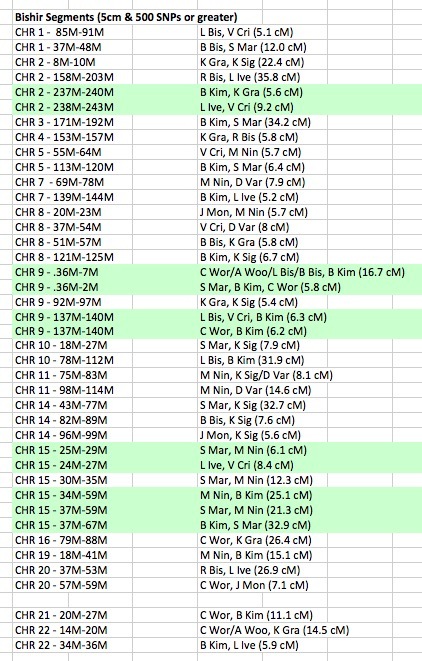 Here is our most recent comparison of each descendant to each other descendant. Matches are show in green. A demonstrated lack of any match is shown in pink. Values (where known) are either the total centimorgans of shared DNA between the two persons or the length of their longest shared DNA segment as well as the number of segments shared, if known (close relatives are not measured). Those marked in green represent triangulations (three or more widely-separated relatives who share all or part of the same segment of DNA). If we find other people who share that same stretch of DNA, they, too, will be Christopher Bishir descendants! If you are a Bishir/Bisher and have been tested, please share the results with us so that we can post them here. And if you are a male with the Bishir/Bisher surname, please consider a Y-DNA test. You can order a test from Family Tree DNA. If you do, be sure to do it from the Bishir/Bisher DNA Project page (that's us!) so that you get the discounted price. Both males and females can get an autosomal DNA test. These can be purchased from Ancestry.com, FamilyTreeDNA.com (the Family Finder test), or 23andMe.com. We recommend that you start with a test at Ancestry.com because most Bishirs have tested there and you will get far more matches than at the other two testing companies. The cost is $99 (unless there is a sale going on). Once you've tested at Ancestry, you can copy your results over to FamiyTreeDNA.com for just $39 more (no re-testing is needed). 23andMe is $199 and is probably the least valuable of the tree tests so leave that to last. Getting tested at more than one place is worthwhile because you are getting different matches at each company. It's a bit like joining more than one job hunting database. You don't know which one your long-lost cousin may have used. We also ask that everyone who gets an autosomal DNA test also copy their raw data from the test results to www.gedmatch.com. GEDMATCH is a free web site, run by volunteers, that allows you to compare your results with others who have loaded there data there, regardless of which company they used for their test. And it provides access to segment information for people who tested at Ancestry (something you won't get at Ancestry otherwise). We have put together step-by-step guides for transferring your data. It should only take a few minutes. If you have any questions about DNA testing, please send us an email at carleyworth@ucla.edu.